Governor of Tokyo in New York Promoting 2020 Tokyo Olympic Disses Istanbul, Says "Islamic Countries Are Fighting With Each Other, and They Have Classes"
(UPDATE 4/30/2013) Now the governor wants to correct his remarks, according to Nikkei Shinbun. Nikkei quotes him saying "不適切な発言があり、おわびしないといけない。訂正したい Some of my remarks were inappropriate, and I need to apologize. I want to correct my remarks." Governor Inose and his supporters spent all day yesterday criticizing New York Times. According to one of the NY Times reporters, the interview was requested by the Tokyo Metropolitan government, and was conducted in a hotel room arranged by the government for that purpose. The one and only qualification to be the governor of Tokyo must be to be foul-mouthed and classless. And incomprehensible. Uh... Is it some kind of mortal sin not to have hosted the summer Olympics? This governor is proud that he has an excellent command of English language (NOT, as you can see in my past post of his government's Olympic page, which reads just like Inose's remarks in the article above), but on this occasion he used an interpreter. Either he skimped on the fee for hiring the interpreter and got a very bad one, or he paid a lot and still got a very bad one, or he didn't bother to brief the interpreter on what he was about to say, or his staff didn't brief him enough, or he was too full of himself to ask for help. It's very clear from the New York Times article that the reporters couldn't figure out what the governor or the interpreter was saying, either. So they simply transcribed what they heard from the interpreter, and that looks very bad. This visit by Governor Inose was reported by the Japanese media as great success. Go figure. The occasion was some kind of expo at Makuhari Messe in Chiba, attended by people (mostly men from what I've seen) who are very much into costume play and like the world of make-belief. The expo, "NicoNico Chokaigi 2", is backed by the Ministry of Internal Affairs and Communications, and the Ministry of Economy, Trade and Industry. There are booths by Liberal Democratic Party, Japan Restoration Party, Japan Communist Party, and Democratic Party of Japan as well as Self Defense Force and the US Military stationed in Japan. So, it's got to be that wonderful government-sponsored idea of "Cool Japan" where they live the make-belief "reality" of manga, anime, and video games. Quite fitting for a country where boys are like baby-faced girls and girls wear extra-large color contact lenses to look like manga heroines. He looks pudgy and tired. Radon inhalation may not be working. Why should I care any more about a country like this, writing about the nuclear accident and radiation contamination that actually exist, non-stop for over two years? #Radioactive Japan: Boy-Wonder Mayor of Osaka City Wants Spent Fuel Storage in Osaka City, "It's Only Fair"
For the increasingly tired- and petulant-looking boy-wonder mayor aka Toru Hashimoto, inflicting pain and anguish on Osaka City residents by burning disaster debris with heavy metals, asbestos, and radioactive materials in the city he governs is not enough. Now he wants spent fuel from reactors in Fukui Prefecture's "Nuclear Ginza" to be stored inside the city, and all he needs is the assurance from the national government that it is safe to do so. In response to Fukui Governor Nishikawa's remark that the areas that consume electricity should store spent nuclear fuel, Mayor Hashimoto of Osaka City said he would consider storing it if the safety is ensured. Fukui Prefecture is where Ooi Nuclear Power Plant is located, which is the only one in operation in Japan at this time. Governor Nishikawa has said about spent nuclear fuel, "Big cities have been consuming electricity [produced by the nuclear power plants in Fukui Prefecture]. How about storing the spent fuel temporarily in these cities?" He has suggested thermal power plants as candidate locations for spent fuel storage. Mayor Hashimoto of Osaka City says he would accept spent fuel if the safety is assured. "I think it is only fair that the areas that consume electricity should store spent nuclear fuel. I wonder what the national safety standard is, but as long as the framework is there, and if that's the direction, I will explain to the city residents." Mayor Hashimoto's remark is considered to be about the responsibility of municipalities that consume electricity, but his abrupt remark is likely to cause a stir. Just as burning the disaster debris in the middle of large cities (often in the middle of residential areas, as is the case in Tokyo) doesn't make any sense, storing spent fuel "temporarily" in large cities just because these cities consume more electricity doesn't make any sense. But this is post-Fukushima Japan where sense has totally lost its place. Japan does not have the final disposal site for the spent nuclear fuel. You know what happens to all these "temporary" storages - they will become effectively permanent. As for the boy-wonder's so-called explanation, if it is the same as he "explained" about the disaster debris burning to worried and incensed residents, it will be nothing but declaration that he will accept spent fuel in Osaka City. For what it's worth, on the anniversary day of the accident. Apr. 24, 2013 — More than a quarter of a century after the Chernobyl nuclear disaster, many children and teenagers who developed thyroid cancer due to radiation are in complete or near remission, according to a recent study accepted for publication in The Endocrine Society's Journal of Clinical Endocrinology & Metabolism (JCEM). Following the April 26, 1986 explosion and fire at the Chernobyl nuclear plant in the former Soviet Union, the number of children and teenagers diagnosed with differentiated thyroid cancer spiked in Ukraine, Belarus and western areas of Russia. Most of the patients developed the papillary subtype of differentiated thyroid cancer. Although this cancer tends to be more aggressive in children than adults, nearly all of the patients tracked in the study responded favorably to treatment. "Even though some patients did not receive optimal treatment initially, the vast majority went into remission after receiving state-of-the-art radiodine treatment and follow-up care," said study lead author Christoph Reiners, MD, of the University of Würzburg, Germany. "Many patients recovered from advanced cancers. Of this group, 97 percent had cancer spread to the lymph nodes, and 43 percent had cancer metastasize in the lungs." The observational study followed the treatment and outcomes of 229 Belarusian children and adolescents who underwent surgery in Belarus and radioiodine therapy in Germany. The study participants were among the highest-risk young patients exposed to radiation from the accident. Despite the risk, 64 percent of the patients are in complete remission and 30 percent nearly complete remission of their cancer. One patient died of lung fibrosis, a side effect of cancer treatment. Only two had cancer recurrences. The findings suggest victims of more recent nuclear accidents like the 2011 Fukushima accident in Japan face lower risk of developing advanced-stage thyroid cancer, Reiners said. Address all correspondence and requests for reprints to: Prof.Dr.Dr.med.h.c. Christoph Reiners, Department of Nuclear Medicine, University of Würzburg, Oberdürrbacherstr. 6, D-97080 Würzburg, Germany, Tel. +49 931 201 55001, Fax. +49 931 201 655001, E-mail: reinersc@klinik.uni-wuerzburg.de. Context: After severe reactor emergencies with release of radioactive iodine, elevated thyroid cancer risk in children and adolescents is considered the main health consequence for the population exposed. Design: We studied thyroid cancer outcome after 11.3 years' median follow-up in a selected, very high-risk cohort, 234 Chernobyl-exposed Belarusian children and adolescents undergoing post-surgical radioiodine therapy (RIT) in Germany. Interventions: Cumulatively 100 (134) children with (without) distant metastasis received a median 4 (2) RITs and 16.9 (6.6) GBq, corresponding to 368 (141) MBq/kg iodine-131. Main Outcome Measures: Outcomes were response to therapy and disease status, mortality, and treatment toxicity. Results: Of 229 patients evaluable for outcome, 147 (64.2%) attained complete remission (negative iodine-131 whole-body scan and TSH-stimulated serum Tg <1 μ g /L), 69 (30.1%) showed nearly complete remission (complete response, except stimulated Tg 1–10 μ g/L), and 11 (4.8%) had partial remission (Tg >10 μ g/L, decrease from baseline in radioiodine uptake intensity in ≥ 1 focus, in tumour volume, or in Tg). Except two recurrences (0.9%) after partial remission, no recurrences, progression, or disease-specific mortality were noted. One patient died of lung fibrosis 16 years post-therapy, two of apparently thyroid cancer-unrelated causes. The only RIT side effect observed was pulmonary fibrosis in 5/69 patients (7.2%) with disseminated lung metastases undergoing intensive pulmonary surveillance. Conclusions: Experience of a large, very-high-risk paediatric cohort with radiation-induced differentiated thyroid carcinoma suggests that even when such disease is advanced and initially suboptimally treated, response to subsequent RIT and final outcomes are mostly favourable. And of atmospheric testing of nuclear weapons by world nuclear powers, which did not stop until 1980 (China). One of my twitter followers lives in southwestern Japan. A while ago he sent me the result of the test he had it done with the ashes from burning wood pellets in his stove this winter. The lab test, using the germanium semiconductor detector, found 223.8 Bq/kg of cesium-137. He was upset, thinking it is from Fukushima I Nuclear Power Plant, until I pointed out to him that there was no cesium-134 found. The cesium in the ashes is most likely from the fallout from atmospheric testing, and the Chernobyl accident in 1986. He burned 600kg of wood pellets made from cedar trees in Ehime Prefecture in Shikoku Island in southwestern Japan. According to the pellet manufacturer, the concentration factor was about 375, and radioactive cesium (Cs-137) in the pellets was estimated to be about 0.59 Bq/kg. He said he will "entomb" the ashes with concrete and bury. In 2012 he tested the ashes from burning the wood pellets from a different company, and to his great dismay the test found 1,000 Bq/kg of radioactive cesium (Cs-137) in the ashes. He had already spread some of those ashes on his home garden. Those pellets, it turned out, were made from trees from Europe (Sweden, Finland, Germany, Austria) that the manufacturer had started to purchase in 1994 . That manufacturer told him that it had never ever occurred to them that the trees were contaminated from the Chernobyl accident, and there was no regulation on importing. The manufacturer told him that they chose European trees because they were cheap, and supply was steady. April 26 marks the 27th anniversary of the Chernobyl Nuclear Plant accident. It's rather apparent which side wins. In the US Senate, only those senators whose state does not have sales tax are opposing; everyone else is in for more grab from the consumers who buy online. Why Amazon, one of the largest internet retailers? Because, in addition to the one given in the Wall Street Journal article below, the company wants to sell its own tax compliance service to other merchants. Both sides in the online sales tax debate were ramping up lobbying efforts and forming new alliances Tuesday in hopes of swaying a coming Senate vote on a bill that would effectively end tax-free Internet shopping in most states. The bill, known as the Marketplace Fairness Act, would allow states to require online sellers around the country to collect sales tax for them on purchases made by their residents. The legislation would effectively replace a 1992 Supreme Court decision that said a state can't force a retailer to collect sales tax unless the retailer has a physical presence in the state, such as a store or warehouse. That ruling has led to rapid expansion of online sales that often go untaxed. The bill is supported by states and local governments, which say they are losing tax revenue under the current system, and by many traditional big-box and Main Street retailers who say online retailers have an unfair price advantage. In an unusual alliance, Amazon.com Inc., AMZN +2.20% the big online retailer that has benefited from the current rules, has joined in support. Experts say Amazon plans to expand its physical presence in many states in order to speed up deliveries, thereby exposing itself to the tax-collecting obligation. It would prefer that its competitors operate under the same set of rules. Even more unusual, the legislation draws bipartisan support. "It's rare to have an issue like this that cuts across party lines, but I do think there is a growing consensus that the time has come to address this once and for all," said Jason Brewer of the Retail Industry Leaders Association, a group of major retailers that support the legislation, including Wal-Mart Stores, WMT +0.78% Target and Best Buy BBY +1.56% . But with a final Senate vote coming perhaps as soon as Thursday, opponents led by eBay Inc. EBAY -1.15% and other Internet retailers are fighting back, seeking to build on a massive grass-roots push over the last few days. EBay said on Tuesday that hundreds of thousands of its sellers and users had contacted lawmakers in Washington this week to push for changes to the legislation, in response to a plea for help over the weekend by the company's chief executive, John Donahoe. A separate coalition of small online retailers expected several thousand of its members to email lawmakers in opposition to the bill. Grass-roots lobbying over the issue "has ramped up significantly," said Phil Bond, executive director of the coalition, We R Here. "People have heard this before, that the legislation was coming, and it famously never happened. This time people realize we're really voting.…People woke up and got into action." As part of their "last-ditch effort," opponents were pushing amendments to increase the legislation's requirements that states simplify their tax systems, said Steve DelBianco, executive director of NetChoice, a group of e-commerce businesses such as Yahoo Inc. YHOO +1.82% and Overstock.com, as well as News Corp NWSA +0.26% ., owner of The Wall Street Journal. Among the possibilities: exempting more small online businesses, reducing the number of state audits that businesses could face, and offering an opt-out provision for states that wanted to shield their businesses from the tax-collection requirement. Online sellers were being joined by numerous conservative and antitax groups that have concerns about the bill, from Americans for Tax Reform and Heritage Action to the Home School Legal Defense Association. Big Wall Street banks and insurance companies also were raising concerns about the possible state taxation of financial services, although supporters of the bill said that objection was baseless. After the Senate voted 74-20 Monday to move ahead with the legislation, even opponents said the chamber is likely to pass some version of the bill. The legislation faces an uncertain future in the GOP-run House. Uncertain? Who is the paper kidding? The House is run by the GOP House Speaker whose willingness to accommodate and compromise over the so-called "Fiscal Cliff" has led to effective tax increase of 2% for the dwindling middle class. I wonder if anyone in the Congress has been even aware that the Obama administration has been negotiating for the US to join this free-trade trade block with the Pacific Rim countries. As far as Japan goes, the media and the Abe administration have been breathlessly touting the numerous benefits of joining the trade block, while the prime minister himself has admitted he doesn't clearly know what's involved. But not to worry, TPP will help pull Japan from 2 decades in the economic and societal doldrums! No one clearly explains how. From the so-called economics experts in Japan comes this "argument" that unless Japan joins TPP now, the nation will be left out in the world. In the case of the US, TPP is to be sold by the Obama Administration as "job creator". Sounds all too familiar. Washington, D.C. – The Obama Administration today notified Congress of its intent to include Japan in the Trans-Pacific Partnership (TPP) Agreement negotiations. This notification follows an announcement on April 12, 2013 that the United States and Japan had completed bilateral TPP consultations, as well as an announcement by TPP countries on April 21, 2013 that they welcome Japan as a new participant in the TPP negotiations, pending the successful completion of domestic procedures by each TPP country. Today’s notification triggers a 90-day consultation period with Congress and the public on U.S. negotiating objectives with respect to Japan. Acting United States Trade Representative Demetrios Marantis noted in a letter to lawmakers that Japan’s entry into this important negotiation will help to deliver significant economic benefits for the United States, Japan and the Asia-Pacific region. Furthermore, the United States will conduct bilateral, parallel negotiations with Japan to address concerns in the automotive sector and non-tariff measures in other sectors. The Obama Administration will consult closely with Congress and stakeholders on the elements of these negotiations during the 90-day consultation period. The TPP is a key element of the Obama Administration’s efforts to support the creation and retention of high-quality jobs for Americans by increasing exports to the vibrant economies of the Asia-Pacific region. The United States and its TPP partners are determined to expeditiously complete a comprehensive, next-generation agreement. In addition to the United States, the current TPP countries include Australia, Brunei Darussalam, Canada, Chile, Malaysia, Mexico, New Zealand, Peru, Singapore, and Vietnam. To view a copy of the notification letter to Congress, click here. For more information on the Trans-Pacific Partnership and the upcoming negotiating round in Lima, Peru, please visit www.ustr.gov/tpp. "The TPP is a key element of the Obama Administration’s efforts to support the creation and retention of high-quality jobs for Americans by increasing exports to the vibrant economies of the Asia-Pacific region" ??? My personal take of this trade block is to give Brunei, Chile, New Zealand, Singapore, Australia, Canada, Malaysia, Mexico, Peru the two of the three largest economies in the world, the US and Japan, as their markets to sell to. For some reason, Mr. Abe is very eager to join TPP so that he can protect the beautiful, lush and fertile farmland in Japan. The Cabinet Office has released the official paper that says agricultural production in Japan will decrease by 3.4 trillion yen per year　if Japan joins TPP. Japan's agricultural production is about 8.2 trillion yen in fiscal 2011, according to the Ministry of Agriculture. I guess Mr. Abe just wants to look back on what it used to be in Japan in dreamy-eyed nostalgia (as he inhales radon gas to calm his stomach, as the baseless rumor goes...). IAEA Team's Initial Review of Japan’s Plans to Decommission #Fukushima I Nuke Plant: "Define an end-state of the Fukushima Daiichi Nuclear Power Station site"
That was what struck me when I read the IAEA press release. The observations and other recommendations they made after visiting Fukushima I Nuclear Power Plant on April 17, 2013 and meeting with government and TEPCO officials are what you would expect - i.e. nothing new. "Launching efforts to define an end-state of the Fukushima Daiichi Nuclear Power Station site would help focus decommissioning efforts. This effort should be pursued with effective stakeholder involvement." What end result do you want? What do you want to have happened to the plant and the site by the end of decommissioning? Then, can you figure out the steps to get there? Browsing the news in Japan on the IAEA visit and the initial review, I didn't even find a mention of this particular point. It probably totally lost on the reporters, too. 22 April 2013 | Tokyo, Japan -- An IAEA expert team today completed an initial review of Japan's efforts to plan and implement the decommissioning of TEPCO's Fukushima Daiichi Nuclear Power Station. The International Peer Review of Japan's Mid-and-Long-Term Roadmap towards the Decommissioning of TEPCO's Fukushima Daiichi Nuclear Power Station Units 1-4 conducted its visit from 15 to 22 April 2013. As requested by the Government of Japan, the IAEA team held extensive discussions with officials from the Ministry of Economy, Trade and Industry (METI) and Tokyo Electric Power Company (TEPCO). The team also met with officials of the Nuclear Regulation Authority. 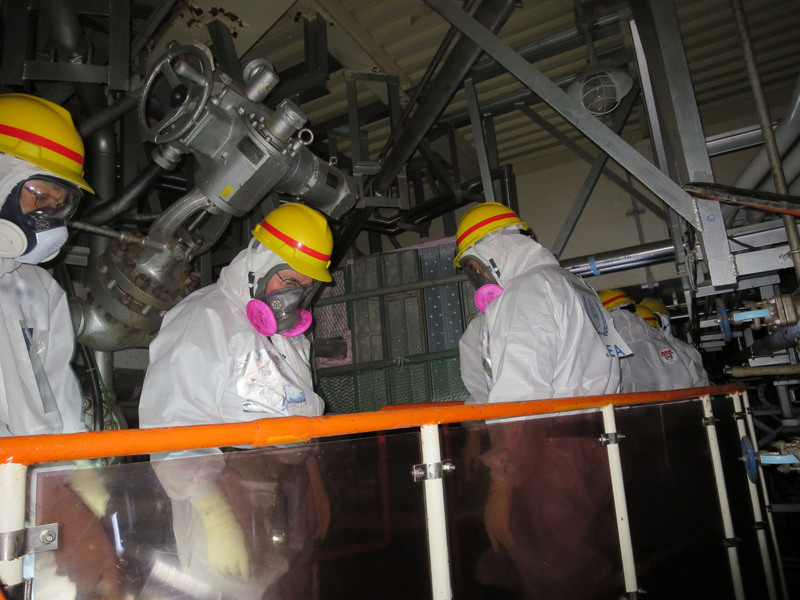 The team visited the nuclear accident site to gain first-hand information about conditions at the power plant and progress toward decommissioning the facility. "Extraordinarily committed workers have made significant accomplishments at Fukushima Daiichi since the March 2011 accident, but Japan continues to face difficult challenges as it works to decommission the site," said team leader Juan Carlos Lentijo, IAEA Director of Nuclear Fuel Cycle and Waste Technology. 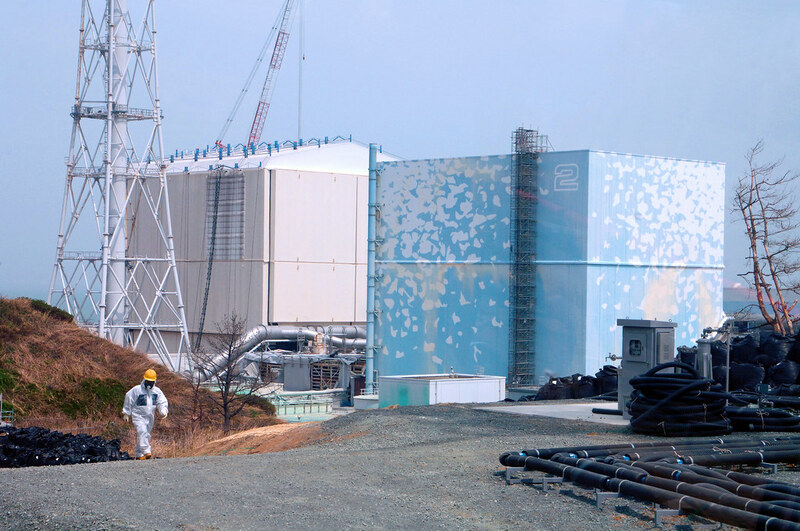 "We saw that TEPCO has achieved the stable cooling of the reactors and spent fuel pools at the site." The 13-member IAEA team examined a wide variety of issues related to decommissioning the Fukushima Daiichi Nuclear Power Station, such as the Roadmap's overall strategic approach, the current condition of the reactors and spent fuel pools, the management of the huge amount of accumulated water at the site, as well as the radioactive releases. The Government of Japan and TEPCO have recognized the importance of effective stakeholder involvement and public communication in dealing with decommissioning programmes. Measures should continue to improve management issues regarding radioactive releases and radiation exposures from the site, particularly issues created by the storage of accumulated water. The team encourages Japan to assess the overall benefit of the site-boundary dose limit, particularly in relation to the radiation levels at the site boundary due to solids and liquids stored at the site. "Our team received good cooperation from all our Japanese counterparts, who are remarkably dedicated to moving forward quickly, yet safely," Lentijo said. "I hope our mission can help their progress, and I know the international community is learning many lessons from the Japanese experience." The IAEA team's final report will be delivered to Japan within one month. Japan's request for the mission came in the context of the IAEA Action Plan on Nuclear Safety, endorsed by all IAEA Member States in September 2011. The Action Plan defines a programme of work to strengthen the global nuclear safety framework, and it encourages the use of peer review missions to take full advantage of worldwide experience. Toyota, Honda, Nissan's slump in China will continue. Honda Motor Co. employees in the Chinese city of Wuhan need only visit the popular Feng Bo Zhuang restaurant to see the resentment their company faces. A sign at the door says Japanese are barred from entering. Discrimination against Japanese is common in China, according to Yasuhide Mizuno, the head of Honda’s venture in Wuhan, some 500 miles (800 kilometers) up the Yangtze River from Shanghai. Mizuno -- who has also been assigned to Thailand, Taiwan, Malaysia and Australia -- says he’s never worked in a more hostile place. “Wherever I go, like department stores or in taxis, people ask me whether I am Japanese,” Mizuno, 49, president of Dongfeng Honda (GHAJCZ), said in an interview at the Shanghai auto show. When he says yes, he said, the reception can be frosty. Mizuno’s experiences in the city, site of one of the bloodiest battles of the Sino-Japanese war in the 1930s, illustrate why sales for Honda and Toyota Motor Corp (7203). have yet to recover since violent protests across China seven months ago. Though the riots -- triggered by a territorial dispute over uninhabited islands -- have subsided, Japanese carmakers are continuing to lose share in the world’s biggest auto market. ...First-quarter China deliveries for Honda, Nissan Motor Co. and Toyota (7203) fell even as overall Chinese car sales rose 17 percent. The share of Japanese brands dropped to 15 percent, versus a peak of 23 percent in 2011, according to the China Association of Automobile Manufacturers. LMC predicts the Japanese will see no growth in China this year, while the country’s auto market will expand 10 percent. Toyota doesn’t expect deliveries in the country to reach pre-protest levels before this autumn, China chief Hiroji Onishi said at the Shanghai show. ...For Honda’s Mizuno, the numbers are personal, though he says things are slowly improving. Japanese expatriates are still turned away from grocery stores, but not as often as before, he said. The Wuhan Tianwaitian Golf Country Club is always booked when he tries to reserve a tee time, he says, though it’s better than simply being told Japanese aren’t welcome on the course, as was the case a few months ago. Wang Qian, a representative at Tianwaitian’s reservations hotline, said the club doesn’t discriminate, though she acknowledged it refused Japanese golfers in September and October. Currently, the club prioritizes bookings for members and Japanese executives don’t belong to the club, she said. At Feng Bo Zhuang near Wuhan’s bustling shopping district, workers in the 150-seat restaurant make no secret of their prejudices. Japanese automakers can’t pin all the blame on political disputes as their cars have a lackluster reputation, according to Zhu Bin, an analyst at LMC Automotive. Sales at Toyota had been falling in the two months preceding the protests, while Nissan was underperforming the broader market. "Lackluster reputation". Coming from Chinese is priceless. Meanwhile 1,000 officers of Japan's Self Defense Force will have a joint drill in June in California with the US military to recapture an isolated island, according to Kyodo News. When I tweeted the military drill news, one follower responded by saying "There is no way that the US will side with Japan. Only a token gesture, because they don't want to anger China." The same kind of people also accused the US for not helping Japan enough in March 2011. The ex-McKinsey consultant minister has been very bullish on things nuclear for some reason. He has already declared that decommissioning of Fukushima I Nuclear Power Plant will be done ahead of schedule of the current roadmap plan of 30 to 40 years. Never mind IAEA (later). Minister of Economy, Trade and Industry Toshimitsu Motegi appeared in a program on BS Japan [BS stands for Broadcast Satellite] on April 23 night, and shared his view regarding the restart of nuclear power plant, saying "It will be (as soon as) this fall." Minister Motegi explained, as the basis for his view, "New regulatory standards by the Nuclear Regulatory Authority will have been compiled by July 18. Then the operators will apply [for restart], and if the safety is confirmed the nuclear plants will restart." The understanding of the municipalities where nuclear power plants are located will be important, but Minister Motegi said, "We will make an effort [to obtain the understanding]", signaling the plan to coordinate with the municipalities after the safety is confirmed. Currently, only one nuclear power plant is in operation in Japan, which is KEPCO's Ooi Nuclear Power Plant (Ooi-cho, Fukui Prefecture). I like the name of the TV station. BS Japan. Priceless. I don't quite understand why it is this minister's business to even speak about nuclear power plant restart. The Nuclear Regulatory Authority is under the Ministry of the Environment. The Nuclear and Industrial Safety Agency, which was under the Ministry of Economy, Trade and Industry, has been abolished. Jiji Tsushin seems to have all but forgotten that in the Fukushima I Nuke Plant accident, areas far wider than the municipalities where the nuclear power plant was located (Futaba-machi, Okuma-machi) have been affected when it says "The understanding of the municipalities where nuclear power plants are located will be important". Long-term memory (more than 1 year), not to mention critical thinking, is not what "Cool Japan" is about, anyway. The team from IAEA, lead by Juan Carlos Lentijo, visited Fukushima I Nuclear Power Plant on April 17, 2013. TEPCO released the still photos and the video of the visit. They went to the place I don't think I've ever seen before: Reactor 4's Torus Room. Photo of Reactor 4 Torus Room, from TEPCO Photos and Videos Library 4/17/2013. Click to enlarge. The video that was released by TEPCO didn't have the segment of the Torus Room. The team also toured the compound on a bus, looked at the in-the-ground waste water ponds from the bus, gave a speech,went up to the operating floor of Reactor 4. Not very interesting. What was very interesting to me was the press conference that the IAEA team gave after the visit, and how it was reported. But that will be the topic of the next post tomorrow. It looks like am impossible task if you see the photo from 2011. Because of extremely high radiation levels on the operating floor of Reactor 3, all the debris removal has been done by remote-control equipments, with some accidents (and with human workers with tungsten vests on the floor to observe the work). Installation of the cover must have been done remotely also. I'd love to see the video if they have one. Bank of Japan to Use Price Forecasts Themselves as Deflation-Fighting Tool? That's what Bloomberg News says Goldman Sachs and J.P.Morgan Chase are thinking. So, BOJ Governor Haruhiko Kuroda will simply declare to the public, "Inflation forecast in fiscal 2015 will be such and such", and people will rush to buy up things now, before the price is supposed to rise according to BOJ, thus creating an actual inflation in which more money chases the same number of goods. This is more farcical than Ben Bernank's antics. As the Bank of Japan prepares to boost its inflation forecasts this week, analysts from Goldman Sachs Group Inc. to JPMorgan Chase & Co. say the estimates may themselves be used as a tool for ending deflation. The BOJ may indicate that its 2 percent inflation target will be reached by spring 2015, the Nikkei newspaper reported April 18. The central bank may upgrade its view on core price gains to at least 1.5 percent for the year ending March 2015, people familiar with officials’ discussions previously told Bloomberg News. Central bank Governor Haruhiko Kuroda, who this week oversees his second board meeting, says stoking inflation expectations can unlock pent-up demand and spur credit growth by alleviating concern real debt burdens will rise. The BOJ risks losing credibility unless prices stop dropping in coming months, with a key gauge showing a 0.3 percent decline in February and analysts estimating another fall in March. Any forecast for price gains in fiscal 2015 is likely to be 2 percent, matching the central bank’s target, according to five out of six economists in a Bloomberg News survey. The BOJ is yet to indicate whether it will release such a projection. The highest forecast since the central bank began releasing estimates in 2000 was 1.8 percent for fiscal 2008. Confidence game. Indeed. As Kuroda has said a number of times, he will do whatever it takes to cause inflation which he calls, along with almost all economists and journalists and politicians in Japan, "price stability". I suppose that can include lying to the public that inflation is coming. As long as it is for the greater good of actually causing inflation. Koroda's policies and actions are considered to have been a great success so far by the Japanese public. Financial Times flat-out says it's been a failure. Secondary disasters such as mudslides and dam-related crises may occur in the days or even months after Saturday's earthquake, threatening the safety of residents and rescuers, geologists warn. Fan Xiao, chief engineer at the Sichuan Geology and Mineral Bureau in Chengdu, said yesterday the banks along the Qingyi River, in one of the most geologically unstable regions of the province, had taken a big hit. Known for its high mountains and deep valleys, the area was already unstable before the earthquake, with villages and roads sitting almost in the path of potential landslides, Fan said. And shockwaves from the earthquake could profoundly increase structural instability in the region. "Residents and rescuers must be highly alert to the dangers of mudslides, especially after rain," he said. "There will be lots of rain in the coming months." Sichuan is also known for its nuclear facilities, many of which are for military purposes. The China National Nuclear Power Corporation announced on its website that its nine nuclear facilities in Sichuan experienced various levels of shockwaves at the weekend, prompting safety checks. There had been no reports of leaking pipes or collapsed buildings at the facilities. As of 6pm yesterday, the quake zone had experienced 1,642 aftershocks - the strongest with a magnitude of 5.4. Looking at the photo in the article (above), I do see the challenge for the rescue workers. China's Ministry of Environmental Protection (MEP) announced on April 21 that "Sichuan-based nuclear power facilities are safe and no abnormalities have been detected in environmental radiation monitoring following a 7.0-magnitude quake" (Xinhua, quoted by China.org.cn website). (UPDATE 4/22/2013) It took workers 4 hours to remove the rats and make sure the transformer was OK. Cooling of Reactor 2 SFP resumed. The water temperature rose 0.1 degrees Celsius to 14 degrees Celsius during the halt. They were discovered by a team of workers patrolling the premise. One of the rats, the gray one in the photo below, looks like he's been there quite a while. Cooling of Reactor 2's Spent Fuel Pool was halted as of 11:36AM to remove the rats and make sure the transformer was not damaged. The temperature of the water in the SFP was 13.9 degrees Celsius. TEPCO estimates a few hours for the work of removing the rats and ensure safety of the transformer.